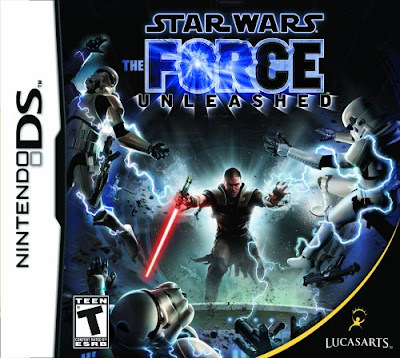 I began the game as darth vader on a misson on the wookie planet: to kill the remaining Jedi. after a duel between the Unnamed jedi and vader the jedi suffers his fate.when vader saves his son the young boy becomes the apprentace of vader. the game follows the story of the boy till his end. there is a good storyline to this game along with a twist at the end. the grapics of the game are good for the ds about that of Iron man or guitair hero. the gameplay is good with ever changeing combonation moves you unlock and new enimys in every level this game is a top in my collection. i would not reccomend this game for young kids because of the gameplay it sis all touch screen and it is hard to master.the T rateing is not needed the violence is not very intence you mainly fight aliens and plant creatures, the only people you fight is the storm troopers and lets be honest the needed to be beat up and taught a lesson! this game is a top buy may the force be with you. I dislike this one on DS, the second is better! not my favorite, but cool story! nerd girl, I like this game to!